McCulloch, M.T., D'Olivo, J.P., Falter, J., Holcomb, M. and Trotter, J.A. 2017. Coral calcification in a changing world and the interactive dynamics of pH and DIC upregulation. Nature Communications 8: 15686, DOI:10.1038/ncomms15686. The global increase in the atmosphere's CO2 content has been hypothesized to possess the potential to harm coral reefs directly. By inducing changes in ocean water chemistry that can lead to reductions in the calcium carbonate saturation state of seawater (Ω), it has been predicted that elevated levels of atmospheric CO2 may reduce rates of coral calcification, possibly leading to slower-growing -- and, therefore, weaker -- coral skeletons, and in some cases even death. Such projections, however, often fail to account for the fact that coral calcification is a biologically mediated process, and that out in the real world, living organisms tend to find a way to meet and overcome the many challenges they face, and coral calcification in response to ocean acidification is no exception, as evidenced by findings published in the recent analysis of McCulloch et al. (2017). Writing in the journal Nature Communications, this team of five researchers developed geochemical proxies (δ11B and B/Ca) from Porites corals located on (1) Davis Reef, a mid-shelf reef located east-northeast of Townsville, Queensland, Australia in the central Great Barrier Reef, and (2) Coral Bay, which is part of the Ningaloo Reef coastal fringing system of Western Australia, in order to obtain seasonal records of dissolved inorganic carbon (DIC) and pH of the corals' calcifying fluid (cf) at these locations for the period 2007-2012. And what did those records reveal? As shown in the figure below, coral colonies from both reef locations "exhibit strong seasonal changes in pHcf, from ~8.3 during summer to ~8.5 during winter," which "represents an elevation in pHcf relative to ambient seawater of ~0.4 pH units together with a relatively large seasonal range in pHcf of ~0.2 units." These observations, in the words of McCulloch et al., "are in stark contrast to the far more muted changes based on laboratory-controlled experiments" (as shown in the dashed black line on the figure), which laboratory-based values are "an order of magnitude smaller than those actually observed in reef environments." With respect to DICcf (also depicted in Figure 1), McCulloch et al. report that the "highest DICcf (~ x 3.2 seawater) is found during summer, consistent with thermal/light enhancement of metabolically (zooxanthellae) derived carbon, while the highest pHcf (~8.5) occurs in winter during periods of low DICcf (~ x 2 seawater)." The proxy records also revealed that coral DICcf was inversely related (r2 ~ 0.9) to pHcf. Commenting on this relationship, the marine scientists say it "indicate[s] that the coral is actively maintaining both high (~x 4 to x 6 seawater) and relatively stable (within ± 10% of mean) levels of elevated Ωcf year-round." Or, as they explain it another way, "we have now identified the key functional characteristics of chemically controlled calcification in reef-building coral. The seasonally varying supply of summer-enhanced metabolic DICcf is accompanied by dynamic out-of-phase upregulation of coral pHcf. These parameters acting together maintain elevated but near-constant levels of carbonate saturation state (Ωcf) of the coral's calcifying fluid, the key driver of calcification." The implications of the above findings are enormous, for they reveal that "pHcf upregulation occurs largely independent of changes in seawater carbonate chemistry, and hence ocean acidification," demonstrating "the ability of the coral to 'control' what is arguably one of its most fundamental physiological processes, the growth of its skeleton within which it lives." Furthermore, McCulloch et al. say their work presents "major ramifications for the interpretation of the large number of experiments that have reported a strong sensitivity of coral calcification to increasing ocean acidification," explaining that "an inherent limitation of many of these experiments is that they were generally conducted under conditions of fixed seawater pHsw and/or temperature, light, nutrients, and little water motion, hence conditions that are not conducive to reproducing the natural interactive effects between pHcf and DICcf that we have documented here." Given as much, they conclude that "since the interactive dynamics of pHcf and DICcf upregulation do not appear to be properly simulated under the short-term conditions generally imposed by such artificial experiments, the relevance of their commonly reported finding of reduced coral calcification with reduced seawater pH must now be questioned." And so it appears that alarmist claims of near-future coral reef dissolution, courtesy of the ever-hyped ocean acidification hypothesis, have themselves dissolved away thanks to the seminal work of McCulloch et al. Clearly, the world's corals are much more resilient to changes in their environment than acidification alarmists have claimed them to be. Figure 1. 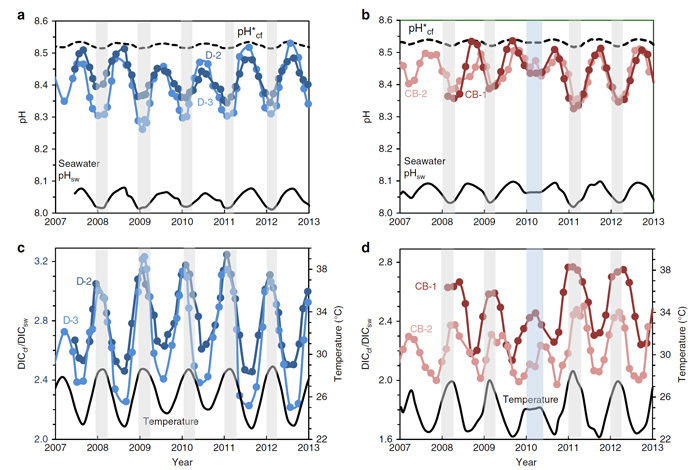 Seasonal time series of coral calcifying fluid pHcf and DICcf. (a) Porites spp. coral calcifying fluid pHcf derived from δ11B systematics for colonies D-2 and D-3 from Davies Reef (18.8°S) in the Great Barrier Reef, Queensland. Shading denotes the summer period when pHcf and seawater pHsw values are at a minimum. Dashed line shows pH*cf expected from artificial experimental calibrations (pH*cf = 0.32 pHsw + 5.2) with an order of magnitude lower seasonal range than measured pHcf values. (b) Same as previous for Porites colonies from Coral Bay (CB-1 and CB-2) in the Ningaloo Reef of Western Australia (23.2°S) showing seasonal fluctuations in pHcf and seawater pHsw. The blue shading denotes the anomalously cool summer temperatures in 2010. (c) Enrichments in calcifying fluid DICcf (left axis; coloured circles) derived from combined B/Ca and δ11B systematics together with synchronous seasonal variations in reef-water temperatures (right axis; black line) for Porites colonies from Davies Reef (GBR). The strong temperature/light control on DICcf is consistent with enhanced metabolic activity of zooxanthellae symbionts in summer. (d) Same as previous but for Porites from Coral Bay (Ningaloo Reef, Western Australia). Source: McCulloch et al. (2017).